SOUTH CHINA -- Zach and Seth Pelletier collapsed into a snowbank following their fourth game of the day Sunday at the inaugural Maine Pond Hockey Classic. SOUTH CHINA — Zach and Seth Pelletier collapsed into a snowbank following their fourth game of the day Sunday at the inaugural Maine Pond Hockey Classic. Years ago, the brothers would have stuck around for a few more games. They did, after all, grow up on this same China Lake where they played dozens of pickup games each winter. But that was years ago. “We played a whole lot when we were younger, but the last time Zach and I got to skate together was probably eight years ago,” Seth said. The Pelletiers starred at Waterville High before moving on to junior hockey and eventually to college, Seth playing for the Air Force Academy and Zach for Ohio State. Once they heard about the tournament and the fact that proceeds were going to the Boys and Girls Club and YMCA of Greater Waterville, their attendance was a given. Seth, 30, lives in New Jersey and caught the last flight out of Philadelphia before Friday’s snowstorm. Zach, 28, traveled all the way from Arizona where he lives and works as a border patrol agent. Friday’s snowstorm forced the cancellation of Saturday’s games and threw tournament organizer Patrick Guerette into scramble mode. 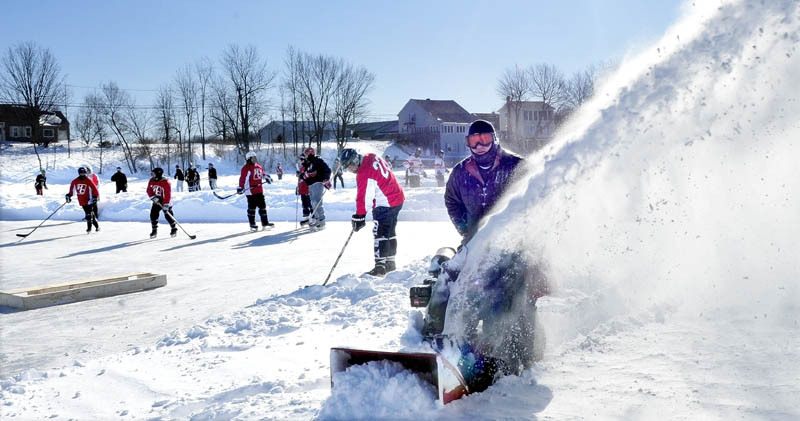 Not only did he have to compress a two-day tournament into one, he had to clear 2 feet of snow off four 60×120 foot rinks. Guerette added one rink to compensate for the shortened schedule and cut the halves down to 10 minutes each. 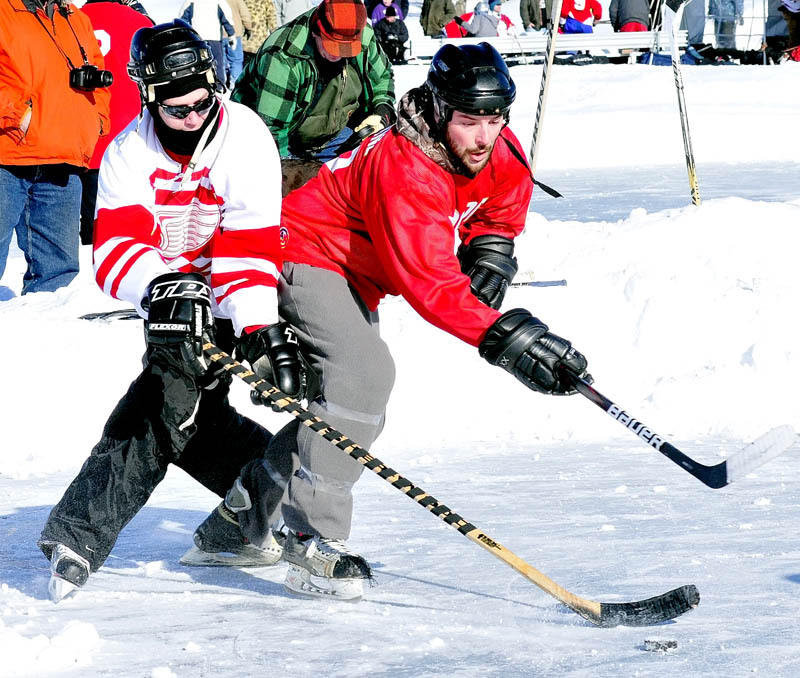 Fourteen teams showed up for the 4 on 4 tournament– two didn’t make it due to the storm — from Portland, Augusta, Waterville, Lewiston and beyond. One team, the Nictaux Chiefs, made the nine hour trip from Annapolis Valley, Nova Scotia to play. Had it not snowed, Guerette said 2x4s would have lined each rink to keep the puck from escaping, but the snow provided 2 foot high barriers and gave it a more authentic outdoor hockey feel. It also kept Guerette and his cadre of volunteers hopping as they cleaned the ice after each game and occasionally flooded a rink. With sun shining brightly and temperatures in the mid 30s, conditions were nearly ideal for the tournament. The ice was another matter. It’s just much more difficult to maintain outdoors. Scoring goals was easier than it looked, though. Teams shot at a flat plywood goal with goals on each end measuring 6 inches high and a foot long, reminiscent of those fans shoot at between periods of professional games. The Pelletier team, named the Fire Road 9 Washups after the road on the lake on which they grew up, went into overtime against the KSS Wild Weasels tied at 6-6. Teams were allowed seven players per game, but a few of the Fire Road 9 members got stranded in Boston due to the storm and they played with just four players. A couple of central Maine teams battled it out in the open division finals with Hart Construction beating Cioppa Construction 12-8 for the championship. Joseph’s Sporting Goods won the Rec division championship, defeating the Blue Ox Bruisers. Guerette got plenty of suggestions from players and volunteers and has already begun thinking about next year’s tournament. Had it not snowed, a freshly scraped and flooded rink would have always been ready for the next game. The tournament incurred some extra costs due to the storm as well, but Guerette believes it will still make a small profit and many more teams will be attracted to the tournament next winter.